اللوحة بها تساقط الوان من بعض مناطق اللوحة. كذلك يعتقد انها رسمة تخيلية للسلطانة هوررم او روكسلانا زوجة السلطان العثماني سليمان القانوني. اللوحة كذلك تعرف ب ليلى في العراق ويعتقد انها تخيلية لفتاة شرقية اسمها ليلى. 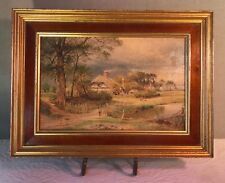 Original Sungott Art Studio replica on canvas of a work by Edouard-Jean Ravel. DeNunzio, Inc. and its divisions,Masters Collection and Old Grange Graphics, have been creating replicas on canvas since 1968. Presents with small loss to (antiquing) varnish upper right corner of canvas. Giclee Printed with Permanent Rich Colors. Canvas Size: 18 x 24. On Stretched Artists Canvas. LIVING ARTISTS GALLERY. Jackson Pollock- Stenographic Figure - HD Print on Canvas 22"x30"
Canvas: High quality canvas. Technique : Giclee print on canvas. Edgartown Lighthouse - Low Tide. A painting of Edgartown Harbor, Martha's Vineyard. Oil Painting on Giclee Canvas. Giclee Printed with Permanent Rich Colors. Canvas Size: 18 x 24. On Stretched Artists Canvas. Up for sale is this beautiful abstract “painting” (textured lithograph on canvas) silhouette of a lovely woman, looking down in adoration at her belly. Painting is a Personal Preference Exclusive. It is signed “Baxter” in the lower-left corner, and serial numbered O2270-2362725 3. Up for sale is this beautiful Asian-inspired “painting” (textured lithograph on canvas) of an eye-catching landscape. Painting is a Personal Preference Exclusive. It is signed in the lower-left corner, and serial numbered O1414-2371501 1. Condition - have scratches and wrinkles. We will try to work it out with you if at all possible. A nostalgic image of near Provincetown on Cape Cod. Giclee Printed with Permanent Rich Colors. during July 4th weekend. Canvas Size: 18 X 24. On Stretched Artists Canvas. Up for sale is this beautiful lithograph on canvas. Image features abstract shapes in hues of reds, blues, pinks, browns, blacks, and purples. It is artist-signed in the lower-right corner, “MDC”. The white border is a little dirty, and may have pinholes in the corners. Beautiful painting "Black Sea Fleet" in World War II. "Rest After the Battle" is considered his most important work.Viktor Puzyrkov was a well-known Soviet-Ukrainian artist who was born in 1918 in Ekaterinoslav (now Dnepropetrovsk), Ukraine. A photo gelatin process applied the colors directly to the canvas, an artist simulated the brushstrokes of the original artist, and crackling was applied. HARLEQUIN LEANING POST IMPRESSIONIST PORTRAIT OIL PAINTING REPRO Description GREAT EUROPEAN PAINTING. HAND PAINTED OIL ON CANVAS GLUED ON CHIPBOARD, NOT A PRINT OF ANY KIND. 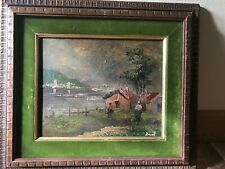 UNSIGNED, PAINTED APPROXIMATELY SECOND PART OF 20TH CENTURY. IT SHOWS BEAUTIFULLY FOR AGE, GREAT ADDITION TO YOUR COLLECTION. THIS PIECE IS 16 INCHES TALL X 12 INCHES WIDE, APPROXIMATELY 40 X 30 CENTIMETERS. GOT IMPERFECTIONS TYPICAL FOR ANTIQUE SHOPS FINDS, WEARS AND SCRATCHES. PLEASE CONTACT ME FOR ANY ADDITIONAL INFORMATION.ALL QUESTIONS ANSWERED DAILY WITH ALL OF MY KNOWLEDGE.I WILL DO MY BEST TO GIVE BUYERS THE BEST SERVICES I CAN.PLEASE ALLOW ME TO RESOLVE ANY PROBLEM YOU MAY HAVE PRIOR TO OPEN A ISSUE OR LEAVE FEEDBACK.HAPPY BIDDING. inkfrogproseries Shipping Terms SAVING MONEY IS A PRIORITY SO I ALWAYS TRY TO CHOOSE THE LEAST EXPENSIVE METHOD OF SHIPPING. UP FOR SALE IS THIS VINCENT VAN GOGH REPRODUCTION OIL ON CANVAS PAINTING SIGNED BY ARTIST LILA CROSBY. DATED 1970. TITLED "FISHING BOATS ON THE BEACH". THE SIZE IS 29" X 41". AGE SPOTS ON BACK OTHERWSIE THE CONDITION IS GREAT. World Famous DeNunzio, Inc. Masters Collection and Old Grange Graphics, have been creating replicas on Canvas since 1968. This piece has been hand painted by an artiest, in as exact an imitation of the original oil painting as possible. A photo gelatin process applied the colors directly to the canvas, an artist simulated the brushstrokes of the original artist, and crackling was applied. The colors have faded over the years. This painting is a Nelson Rockefeller series collection. Oil-like reproduction, limited edition painting number 3 of 95 (see photo). Nelson Rockefeller Collection was established in the 1970's. Nice shape beautiful and realistic painting.